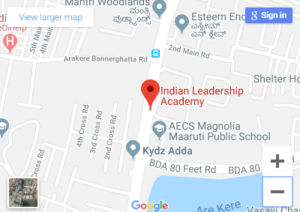 Indian Leadership academy is committed to respect your privacy and choices while using our website. The statement highlights our privacy practices regarding Personal Information that we hold about you. In general, you may browse our website without providing any Personal Information about yourself. However, certain information such as your IP address, demographics, your computers’ operating system, and browser type may be collected in order to provide better usability, troubleshooting, site maintenance, and to understand which parts of the website are visited and how frequently. When you register on our website or would like to comment on our content, we may require you to provide us with certain Personal Information. All the above details may be used for one or more of the following purposes: user ID creation, identifying you, contacting you and provide access to desirable content based on your preferences. While accessing certain sections of the Indian Leadership academy Website such as Quick Enquiry, Online Chat, Work with us you may also be required to provide additional Personal Information for us to process your request. If you choose not to provide your Personal Information that is mandatory to process your request, we may not be able to provide the corresponding service. The information contained in this website is for general information purposes only. 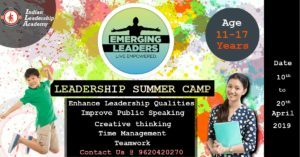 The information is provided by Indian Leadership Academy Pvt. Ltd. and while we endeavour to keep the information up to date and correct, we make no representations or warranties of any kind, express or implied, about the completeness, accuracy, reliability, suitability or availability with respect to the website or the information, products, services, or related graphics contained on the website for any purpose. Any reliance you place on such information is therefore strictly at your own risk. And no event will we be liable for any loss or damage including without limitation, indirect or consequential loss or damage, or any loss or damage whatsoever arising from loss of data or profits arising out of, or in connection with, the use of this website.